I love Jake Helman. I love him, I love Greg Lamberson for bringing him to me, I love Medallion for bringing it to print, and I love… well, everything about this series. And I’m so happy to report to you that this is the best book in the Jake Helman Files to date. 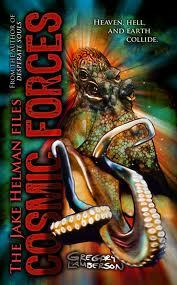 Cosmic Forces is full of action, suspense, gore, hilarious one-liners, and a hero that puts all others to shame. And a really friggin’ big monster. Oh yeah, this one is huge. The whole damned book is huge. From concept to characters, action and plot, this whole thing feels like holding a million pounds of creativity packed into a small, book shaped package. When the wife of New York City mayor Myron Madigan hires private investigator Jake Helman to spy on her husband, the trail leads him to Karlin Reichard. The wealthy industrialist and kingmaker leads to a cabal that has secretly manipulated world affairs for generation. In order to bring these powerful men down, Jake must join them. But at what cost to his own soul? Battling human assassins and supernatural creatures, Jake pursues a quest to uncover the mystery behind the Order of Avademe and a monster willing to destroy heaven and hell to rule the earth. In what is definitely the biggest, most ambitious plot in the Jake Helman series, Lamberson dishes out heaping loads of pain, torture, and terrifying situations to (in my opinion) the best damned hero of modern fiction. Not only that, but Lamberson expands upon the world that Helman inhabits, revisiting some of his earlier cases, and setting up more questions about some of the secondary characters that we just knew had something more to them. The year-long wait for this follow-up to Desperate Souls and Personal Demons was well worth every single literary withdrawal symptom I experienced. Unfortunately for me (and you folks, too), we’ll be waiting until 2012 for the aptly named follow-up – Tortured Spirits. Getting back on track – this time around we find Jake fighting all manner of creepy-crawly nasties in search of information pertaining to his current case. Lamberson has always excelled at creating incredible characters, as Jake Helman’s undeniably strong and larger than life existence will tell, and the folks in Cosmic Forces are no different. From the get-go, Lamberson throws nothing but true, realistic dialogue, and emotive characters into the mix, really fleshing out the story for all it’s worth. From Madigan’s wife to his dwarf-like assistant, Lamberson surrounds Jake and the entire plot with a spectacular cast that showcases his practiced ability to give the reader what they want, and the author’s own incredible understanding of character creation. Again, Lamberson has given the reader not just a story, but also the literary equivalent of the cinematic experience. It’s not hard to imagine this series as a film franchise, but given the extremely detailed plots, it would hard to believe that Hollywood or any other film maker would be able to do it justice. Not to mention the sheer amount of time it would take to create some of the monsters that Lamberson has dreamed up this time. Now, earlier I said that this is the most ambitious of all of the Jake Helman books. I said that with good reason. Lamberson has upped the ante in this one considerably. Not only is Jake going head to head with a giant monster, the likes of which I won’t explain for the sake of the spectacularly grand reveal in the novel, but he’s also going up against several very powerful men and the powers of good and evil themselves. The team-ups in this novel are incredible as well, making Cosmic Forces switch from a dark, noir-ish tale to a full on comic book style replete with some of the best action we’ve seen so far. The ending just begs for a huge and triumphant orchestral score to punctuate every Biff!, Bam!, and Boom! that Jake and his fellow renegades deliver to their enemies. I was compelled to read this scene twice, just because it was so damned fun. There are some incredibly detailed and creative biblical references in this book, as well. All of the mythos draws from some sort of religious background, with under (and over) tones of occult themes thrown in for good measure. Lamberson travels a great distance to create his own mythology in this story, crafting an almost entirely believable back story that could very well serve as a cult belief in and of itself. Like his previous efforts, and his novel The Frenzy Way, Cosmic Forces is incredibly well researched, and will satisfy almost every answer that could pop into your head regarding the information contained herein. The only pieces left untouched hint at a story that would be very welcomed as a follow-up. If I’m right, Tortured Spirits could very well be even better than its predecessor. This book really has everything I, as a reader, could ever want i a horror/crime crossover story. Apart from Mike Oliveri’s The Pack: Winter Kill, I have yet to find a series that grabs my attention as much as this one does. Lamberson knows exactly what he’s doing, and creates a different, more emotionally charged, and thematically huge story with every subsequent release. You won’t be disappointed with these books, folks. This series is 100% Dreadfully Approved. Check out Medallion Books here, and Greg Lamberson’s website here. For a limited time, you can grab a free e-copy of Personal Demons – the 1st book in the Jake Helman Series – at Amazon, and other online retailers.